Towards the end of the football season, intensity and pressure increase. Sport-locker.net can today reveal the Intense Heat Pack – which leverages warm hues that symbolise the intensity of this critical juncture in the season. All four of the bright uppers are united by the same colour-shifting Swoosh. The lenticular effect on the Swoosh creates depth and variance in its colour, which will appear prominently purple on the pitch. The cool tones of the Swoosh offset the warm shades of the upper for a stunning contrast in this colourful pack. 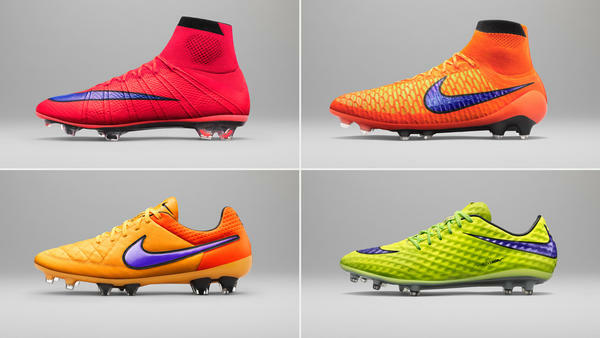 Professional players will begin wearing the new colourways this week and the boots will be available on www.nike.com March 27. What do you think of the Nike Intense Heat Pack? Let us know in the comments section below or on our Twitter and Facebook pages.